Have you been having trouble sleeping but you can’t figure out why? Restless nights can leave you with unproductive days and sleepiness, which can affect your professional and personal lives. If you’ve been struggling with sleep, you may have sleep apnea. This common disorder can lead to poor sleep and the affects that come with it. That’s why we offer sleep apnea treatment in Jacksonville. Dr. Matthew Nawrocki and Dr. Richard Aguila take pride in their ability to help their patients sleep more soundly and comfortably. Sleep apnea is a condition that causes patients to stop breathing during sleep. 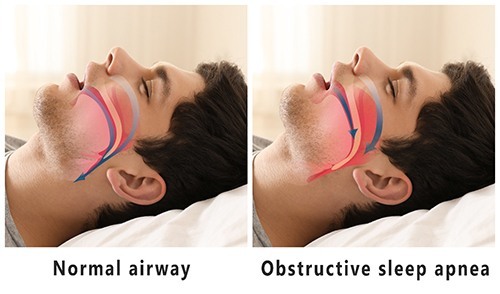 While there are different types of sleep apnea, the most common is obstructive sleep apnea (OSA). This is a blockage in your airway caused by relaxed muscles when you sleep. Those with OSA can stop and start breathing sometimes hundreds of times during one night. While this is a serious problem on its own, lack of sleep can lead to a whole host of other problems such as high blood pressure, heart problems, diabetes, liver issues, and other complications. If you or your partner notice any of these symptoms, contact our office right away. Our dentists will be able to diagnose your sleep apnea and provide you with the right treatment to give you your full night’s sleep. A Continuous Positive Airway Pressure (CPAP) machine uses a nasal mask to deliver you a steady stream of airflow while you sleep. This was the only way to treat sleep apnea, and while effective, it can lead to uncomfortable side-effects. That’s why we offer oral appliance therapy at Jacksonville Dental Specialists to give you a good night’s sleep with the healthiest treatment possible. We create custom-made oral appliances to reposition your jaw and tongue. This keeps your airway open and unblocked, allowing for restful and comfortable sleep. This treatment also helps patients who struggle with snoring. Snoring and sleep apnea are often related, which is another reason why this treatment is so effective—it helps eliminate both of these issues. Call our office if you or your partner notice any symptoms of sleep apnea. We will answer any questions you may have, and we look forward to helping you get a complete night’s rest.